Video Sources — create guide data. Input connections — Assign EPG data sources to capture cards / video inputs here. Storage Directories — Configure (but not create) directories MythTV uses as storage for the likes of recordings. System Events — Configure scripts to be run by event triggers. This chapter explains all the basics but for your convenience we have included specific chapters in this manual for each type of capture device (See the index of this manual). For flexibility, MythTV uses a modular approach to internal architecture. This - unfortunately? - also means that the MythTV administrator - You! - has to get familiar with this architecture to make the most of your system, especially if it contains more than one single capture card! The first element in any MythTV system is the capture card(s): these can be actual TV cards (analog or digital), 'Virtual' IPTV cards such as the FreeBox recorder, or simply video capture cards connected to an external set-top box. All these cards provide a video feed to the system. They receive orders from the system to change their active channel(s), move a satellite dish, simulate a remote key press, you name it. One of the strengths of MythTV is that you can install several capture cards on your system and merge content from many different origins on the same box: DVB, Analog TV, IPTV, etc, and to allow recording a program (or several if you install more cards) while watching another. Video Sources define the methods for retrieving Electronic Program Guide data (EPG) into the system. These sources can be created using mythtv-setup and then associated with specific Capture Cards in the Input Connections screen. MythTV can extract EPG from capture cards that support this, but since broadcast EPG data is usually fairly limited in terms of timespan and content, it can also download data from the Internet using ancillary software such as XmlTV. Adding a new video source. 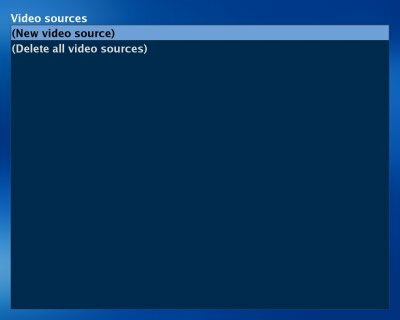 Video source configuration in mythtv-setup. Section 9.1 of the manual describes the setup process for video sources. North American users can choose Schedules Direct to supply the schedule information while those outside North America should use XMLTV. Transmitted guide data (EIT) can also be used as a source or a supplement to the other sources if it is available. This information is stored in the database as entries in the videosource table. Note: one should almost never enable EIT when using Schedules Direct in the US. The (bad) EIT data provided by most providers will stomp all over the (good) Schedules Direct data. Also it is highly recommended that if you are using a source with a large number of channels that you remove as many as possible, especially ones you don't receive. To ensure that updates in Schedules Direct are properly captured by MythTV, you should go to "Program Schedule Downloading Options" (the last page under General settings), then enable "Automatically update program listings" and set "Guide data arguments" to "--dd-grab-all". Once you have defined your capture card(s) and Source(s), you will move on to "Inputs". Inputs are where you link one or several capture cards (providing video streams) to a source of program guide data (providing information about the video streams in question). This allows you to define channels that each capture card can record. Beware, though: you should not link several different types of capture cards with the same source. e.g, a video source for a DVB USB dongle will have one set of channels. That same set of channels will not be used for IPTV streaming from your ISP or PCI Analog TV capture card. One situation where you will link several capture cards with the same source is when those capture cards are all the same type (eg. all DVB and they get the same input feed, or all Analog, etc). Sometimes, you will want some same channels in several input connections. For example, if you have a CI/CAM for subscribed TV programs, but the CI is only available for one tuner (but FTA to both), you need to create separate Video Sources for each different channel set, and connect them to the corresponding cards. The identical channels will be listed twice in the channel editor, but only once by the frontend. This last setup screen shows you the result of all the previous steps: a complete list of all the channels that were detected for all the capture cards on your system, along with the name of the EPG source linked to each channel. 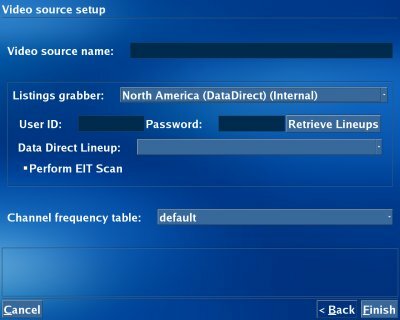 In the edit dialog for each channel, you will be able to specify if EPG data for the channel should be gathered over the air, or should come from a specific XMLTV program ID. This is where you will see whether your XMLTV grabber correctly identified each channel or not: if not, you will end up with bogus channels with "???" as channel number. If so, simply write down the XMLTV ID for the bogus channel and put this ID in the real channel. You can then delete the bogus channel. One thing to watch for, in case several of your capture cards receive similar channels - for example, analog and DVB cards that have some TV channels in common - : you cannot use the XMLTV ID of Source 1 as the XMLTV ID for a channel that belongs to Source 2, even if the channels are the same. This sometimes means that, unfortunately, you will end up duplicating xmltv grabbing for the same channels on each source: if you are reluctant to do this, you can move on to more advanced settings and grab the guide data once, and feed it to several sources, but this is beyond the scope of this introduction. The last element, and arguably the most important, is the channel: channels in MythTV are identified by quite a few elements: "Channel Name", "Channel Number", "Channel Callsign", not to mention extra info such as channel frequency info, etc. Depending on the type of capture card that you use, some elements are used, and some are not: typically, for DVB channels you will not setup anything in the frequency fields - I am not quite sure whether the channel Callsign, Name or Number or a combination are used to tune the channel with DBV tuners - . A page or section should probably be written to describe all this more in detail, but this again is beyond the scope of this intro! Storage Groups are lists of directories that are used to hold MythTV recording files. By default, there is only one Storage Group, called "Default". Note: At least one recording directory has to be added to the Default Storage Group or it will not be possible to watch/record anything with MythTV. Additional Storage Groups can be created to store specific recordings in their own directories. Storage Groups are edited via the 'Storage Directories' section of mythtv-setup. It may be desirable to add multiple directories (which are mounted on different hard drives) to a Storage Group in order to spread out filesystem I/O onto multiple filesystems. Multiple Storage Groups can also be created to group recordings together; recording schedules now have an option to specify which Storage Group to use. MythTV will balance concurrent recordings across the available directories in a Storage Group in order to spread out the file I/O load. MythTV will prefer filesystems that are local to the backend over filesystems that are remote until the local filesystem has 2 concurrent recordings active or other equivalent I/O, then the next recording will go to the remote filesystem. The balancing method is based purely on I/O, Myth does not try to balance out disk space unless a filesystem is too low on free disk space in which case it will not be used except as a last resort. Storage Groups are global, but can be overridden on a slave backend by creating a local Storage Group by running mythtv-setup on the slave. If a problem occurs and the slave backend is unable to use the desired Storage Group, it will fail back and try the directories defined in the master's Storage Group. A special 'LiveTV' Storage Group may also be defined. If a LiveTV Storage Group directory exists, it will be used instead of putting LiveTV recordings in the Default Storage Group, allowing LiveTV recordings to be stored on their own filesystem. This is similar to the old MythTV method which used a RingBuffer for LiveTV. To remove a storage group from the list, highlight it and press the 'D' key. This does not "delete" the files, it only removes the directory as a storage location. If the storage group you wish to remove is not empty (which is likely the case as MythTV balances the load), you can move these files from one storage group to another with a regular filesystem move. The next time MythTV tries to access these files, it will automatically search all available storage groups to locate them. Usage information for all Storage Group directories is visible on the mythfrontend status screen as well as the mythbackend status webpage. MythTV is smart enough to determine which directories are on shared filesystems so it should not count free or used space multiple times if more than one directory is on the same filesystem. Added by Darryl Ross on 2007-03-06: Some details about the algorithm and weighting Myth uses to spread out the recordings across disks in the storage groups is on the Storage Groups Weighting page. Thanks to Chris Pinkham for the details. The "global" setting "Extra Disk Space," specifies the amount of extra space to keep available on each filesystem, not a total amount of extra space to keep available across all filesystems. Therefore, if the "Extra Disk Space" is set to 3GB, it should be keeping 3GB available on all filesystems (to which Myth is recording at any particular time). That parenthetical can actually be very important. If Myth is not recording to a filesystem, it does not autoexpire programs to make room for the data that some other process is writing to that filesystem. Therefore, until a recording starts and is being written to the filesystem in question, no programs will be expired from that filesystem. Introduced in r12151 and first released in 0.21. Documentation initially copied from Installing and using MythTV. This page was last modified on 16 February 2015, at 02:00.